February 6, 2017: The Email Privacy Act (H.R. 387) passed the House of Representatives by a unanimous voice vote on Monday, February 6. We are excited to hear about the bill’s passage, as it includes important protections and warrant restrictions for law enforcement to abide by when accessing electronic communications. The bill will now move on to the Senate. Learn more about the bill below, and read what others had to say in this recent news article. January 30, 2017: Golden Frog joined many other organizations and advocacy groups in signing on to a coalition letter, organized by CDT, which supports the the Email Privacy Act. As stated in the letter, the bill is identical to the one introduced last year, and “represents true bipartisan, commonsense reform on privacy and was endorsed unanimously by the House of Representatives in the 114th Congress.” More details can be viewed in the full letter. January 10, 2017: Congressmen Kevin Yoder and Jared Polis dropped the Email Privacy Act (H.R. 387) yesterday, reintroducing the bill in the House. The Email Privacy Act previously passed the House of Representatives in April 2016, without opposition and widely supported as a bipartisan piece of legislation. The final vote was 28-0. The Email Privacy Act is the policy update to ECPA (Electronic Communications Privacy Act), which governs how and when the government can view electronic communications, or the privacy of these documents. The communication methods include email, as well as documents stored in the cloud. ECPA was originally written in 1986, and is grossly outdated when you consider the technological advances and shifts in communication since then. We’re pleased to see the Email Privacy Act being pushed forward, and again affirm our support for this legislation. As the bill received widespread support last year, we hope to see it garner the same support in this Congress. We urge everyone to take into consideration the value of personal communications, and the importance of protecting privacy in today’s digital age. In addition to providing some much needed privacy protections, the Email Privacy Act also represents the importance and necessity of updating legislation to respond to changing trends and innovations in the technology industry and the world at large – especially for the cloud computing industry and businesses. 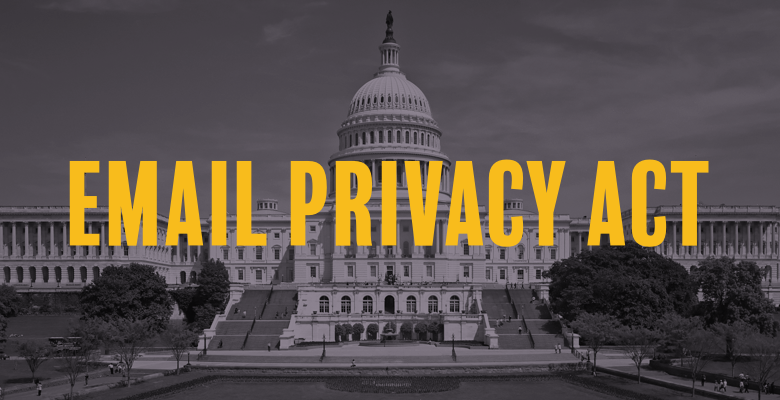 We urge the speedy passage of the Email Privacy Act, as an update to ECPA is more than long overdue. Last year, we signed on to a coalition letter organized by our friends at CDT supporting the legislation (in addition to other previous efforts on ECPA), and we will continue to support it as it moves forward. Information on how you can get involved is included below. Help support the Email Privacy Act and push it into law. Contact your representative and urge them to support the Email Privacy Act now. What is ECPA and Why Does it Need Reform? ECPA sets the rules for when police and the government can read our email, look at our photos and access other content stored in the cloud. ECPA has remained unchanged since it was originally passed – in 1986. This is concerning considering the huge and widespread technological advances that have taken place since then, which have left our communications open to unwarranted government intrusion and privacy violations. As the law is currently written, government and law enforcement officials can access personal communications and documents in remote storage in the cloud after 90 days with merely a subpoena, meaning no prior consideration from a judge is necessary. This opens the door for government snooping and privacy violations, as well as threatens fourth amendment rights. Learn more about ECPA reform, legislation, and previous efforts to move the Email Privacy Act forward.